Actinometer, bookform, in wallet. Fold-out card containing instructions booklet, all within paper wallet. Hurter and Driffield Actinograph Patent No. 5545 1888, with slide rule calculator with roller, seals for H & D speeds 300-0.5: light: very dull - very bright, aperture f/2.8-64, exposure time 0.05sec to 60 secs. Time of year and day on roller. Calibrated for North latitude 52 30 0 degrees. In wooden case. Marion & Co. 1892. The Infallible Exposure Meter Company, Wrexham. Pocket-watch form actinometer; in tin with instructions, plate speed chart, replacement Autochrome dial and 2 packets of rapid deadmatch paper. Wooden slide rule type calculator for exposure. Flat wooden plate marked with 3 scales. Speed 0.5-300. Exposure 0.005-60seconds. Lens f/2.8-64. Slide marked with weather: Very dull, dull, mean, bright, very bright. With speed index mark. Card insert carries time of day and year scale for North latitude 7 degrees and 30 foot. Hurter and Driffield. c.1898. Two hinged brass strips - one with small cylinder for sensitive paper and milled grooved, the other with circular aperture and standard tints (missing). For carbon printing. 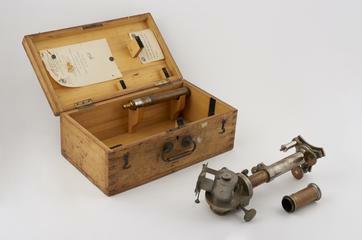 Special Akuret actinometer, made by Portable Studio Manufacturing Co, c.1900. Printing frame with 21 step wedge, in 3 rows. Used for carbon and platinotype process. Cost 3/6. Wynne's Innfallible actinometer. Watch form actinometer, plain glass and mask with standard tint over paper disc. Cailbrated in German. Haka expometer. Disc form actinometer, metal. Metal calculator rings and mask rotate over disc of sensitive paper, held by friction of emery paper stuck in back. In leather pouch. Bookform actinic meter by Imperial Dry Plate Co., Cricklewood. No.1 bright light, No 2, dull light. Sliderule instruction calculators. Two instruction books and pack of sensitive. Burton carbon print meter. Metal box with wooden paper holder. Lid carries 6 identical negatives under stop wedge. Stanley actinometer. Small pillbox type actinometer for strip of sensitive paper. No calculator. Haka expometer. 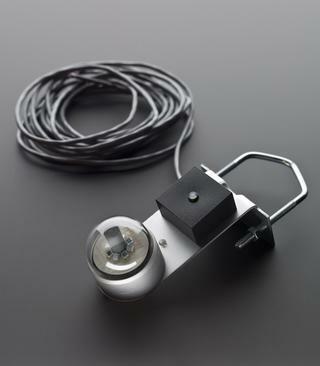 Disc form actinometer, metal. Metal calculator rings and mask rotate over disc of sensitive paper, held by friction of emery paper stuck in back. Wynee's Infallible Hunter meter. An actinometer - pocket watch form; opens to reveal sensitive paper holder in one half and calculator in the other, Scales: 64 seconds to 1/1000, f.3 1/2-156. 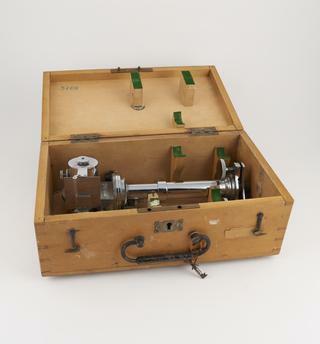 Watkin's exposure meter (pocket watch style actinometer) in box with leaflets and tint plate dial. Bookform actinic meter by Imperial Dry Plate Co., Cricklewood. No.1 bright light, No 2, dull light. Watch pattern actinometer in original tin with instructions , Rapid Deadmatch paper. Wynee's Infallible Hunter meter. Watchform actinometer. Sensitive paper visible through window in the face; two scale 1/128 - 64, F. 4-362. 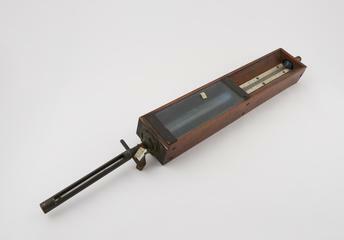 Penrose Carbon Actinometer; step wedge numbered 1-10; provision for roll of paper. Burton carbon print maker. Box with wooden paper strip carrier. Lid carries 6 negatives under a step wedge. 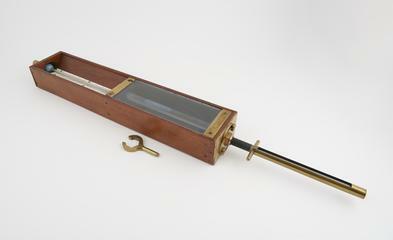 Watkins snipe actinometer, made by Alfred Watkins. Designed 'for open snaps'. 40mm round tin with card and glass lid; felt pads support paper discs. Darken 4 seconds for number 1 stop, single lens, 6 seconds. VPK 12 seconds RR. Electronic actinometer, radiation sensor, pyranometer, set in demonstration stand (museum? ), by Skye Instruments Ltd, Llandrindod Wells, Wales, 1999. With instruction leaflet. R Field & Co., Birminghm, 'Sole Makers'. Cylindrical actinometer; chain timing pendulum.